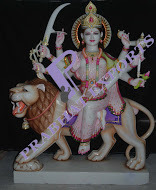 We are prominently indulged in manufacturing, supplying and exporting Marble Durga Statue in unique designs and postures. The offered statures are well painted by the expert craftsmen utilizing alluring colors to reflect every feature with utmost beauty and elegance. Further, to provide a splendid appeal to these statues, facial expressions are minutely and carefully carved with perfection. We are offering the customers with Marble Durga Statue which is precisely fabricated from flawless marbles by our expert craftsmen. This statue is provided in pure marble form with no colors and paintings to depict the strength of goddess Durga with utmost calmness and simplicity. For meeting the distinctive demands of the clients, we provide this range in varied sizes such as 12, 15, 18, 21, 24, 27, 30, 33, 36, 39, 42, 45, 48, 51, 54, 57, 60, 63 and 66 inches. 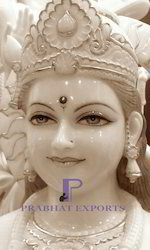 Marble Durga Maa Statue Maa Durga is manifestation of femininity and extreme power along with beauty and compassion. 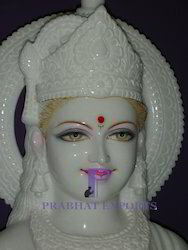 We are offering an extremely wide range of beautifully made statues that represent realistic forms of deities. 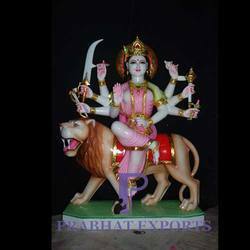 Marble Durga Maa Statue is available in its ethereal form which is appreciated by viewers. 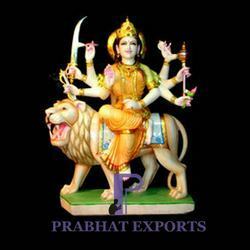 We have a wide collection of Goddess durga, Sherawali Mata statues. As the name suggests, this statue shows Goddess Durga sitting on lion. In this statue, a lot of emphasis is given on the minutest details carefully depicted through the colors combinations. With the aid of state-of –the-art infrastructure, we are capable of serving the customers with Hindu Goddess Durga statues in numerous sizes and designs. Our offered statures are specifically designed by the experts utilizing modern technology and optimum quality marbles. Ornaments and weapons of goddess Durga are painted with golden brown color to infuse an unmatchable shine and appeal to these statues. Clients can avail this range in standard and customized specifications from us at industry leading prices. 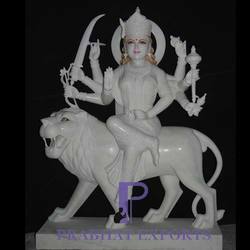 Clients can avail from us marble made Lord Durga Statue which depicts the utmost strength of goddess durga. In the offered statue, goddess durga is dressed in pink saree and sitting on the lion. 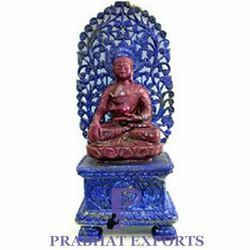 Beautifully sculpted in alluring colors and minutely carved features, our range is highly demanded in the market. For meeting the exact requirements of the clients, we provide this range in numerous sizes and colors in desired quantities and packaging. Backed by an expert team of craftsmen, we have brought forth a splendid assortment of Goddess Durga Statues. We have precisely designed this range by making use of high grade marbles which are procured from the certified vendors of the market. Our experts have minutely carved the expressions and features of goddess Durga to do full justice to the feelings of the devotees. We provide these statues with a marble platform to provide support to the figure. With the aid of sophisticated technology, we are able to present the customers with superior quality Lord Buddha Statue. Manufactured from optimum grade semi precious stone, this statue depicts the figure of god Buddha in the meditation position. Our expert craftsmen have perfectly carved these statues with ruby stone while his throne is elegantly crafted from lapin stone. These statues can be avails in varied sizes and designs as per the particular requirement of the clients. 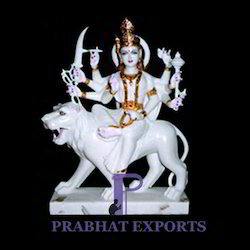 Owing to rich industry expertise and experience, we are instrumental in manufacturing, supplying, exporting a wide collection of Marble Maa Durga Statue to our esteemed customers. Our range is designed by our skilled professionals and with the use of pure white marbles in order to sync with the International standards.